The Windows 10 April 2018 Update has started to roll out to users around the world, and it has not been without its problems. One issue that some people have noticed is that the "Feedback frequency" setting cannot be changed. Users are complaining that the setting has a new label reading "Windows Insider Program manages this option" -- regardless of whether the computer has been part of the Insider program or not. An update is available to address the problem, but it has to be installed manually. 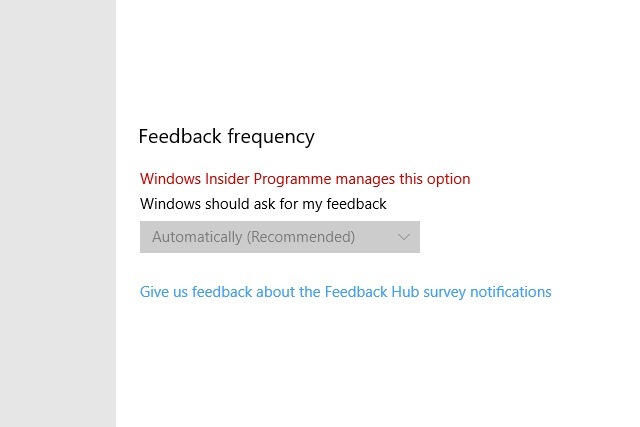 That Microsoft would like to pester Insiders for feedback about Windows 10 is not surprising, but an inability to change the frequently with which alerts are sent out has caused more than a little annoyance. Download the required cumulative update from Microsoft. Launch an elevated command prompt by clicking the Start button, typing cmd, right clicking the Command Prompt shortcut and then selecting the Run as administrator option before clicking Yes in the UAC dialog. Hit Enter and wait while the update is processed. You might find that the update takes a while to install, but once this is complete you should find that the problem is fixed when you restart Windows.